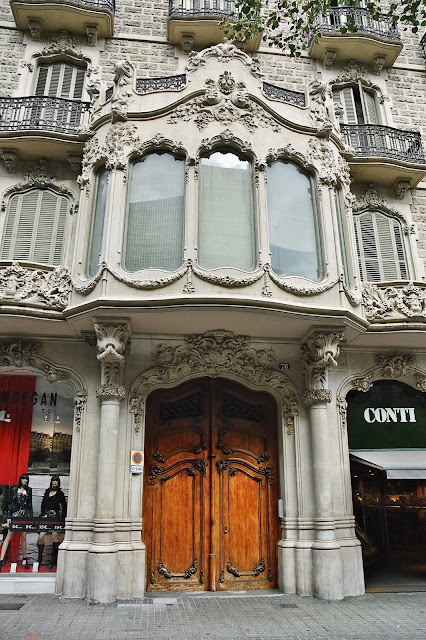 Casa Juncosa at Rambla Catalunya, 78 built by Catalan architect Salvador Viñals i Sabater in 1909 is one of those many buildings that locals tend to ignore (why do humans take things for granted immerse in their monotonous existence as they are? why do we lose that feeling of surprise?) but visitors evidently admire. Check this gallery with incredible pictures of Casa Juncosa interior. Carlos, Casa Juncosa es realmente una belleza. Tienes tanta razon en lo que dices con respecto a la gente y su cotidiano. This is so ornate it takes my breatah away. I stand in awe! That is amazing. Love the doors. argh... i missed this building when i was there. Thanks everyone for the kind words and visit. He pasado varias veces por allí y nunca me detuve con calma a apreciar esa arquitectura. Barcelona es inacabable.